The Old Downes Road has flooded in one place for some years but is now flooding in a second area. This makes it difficult to access the houses and people have been forced to buy 4 wheel drives. 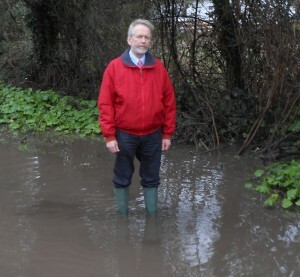 The picture shows Cllr Derek Mitchell checking the flooding recently. I have asked the Council to fix this recurring problem but it is proving a problem as there is no surface water drainage system. I have asked that soak away pits are dug.